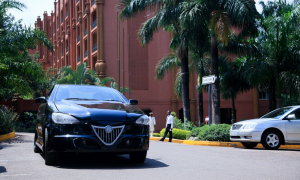 In Uganda, Africa, a team of engineers at Kiira Motor Company (KMC) is pioneering clean, green energy solutions for transportation using New Eagle’s Raptor™ software tools and hardware supply chain. With New Eagle, KMC successfully developed Africa’s first plug-in hybrid sedan, the EV SMACK, as well as its first solar-powered bus, the Kayoola Solar Bus. When KMC needed a fast, efficient and reliable way to develop the control systems for its EV sedan, New Eagle offered the opportunity to assist. New Eagle sent a team of engineers to KMC’s worksite, where they introduced Raptor™ ECU-based rapid prototyping. KMC’s EV SMACK, a green vehicle in Africa developed with New Eagle’s Raptor™ control platform. With New Eagle’s intuitive software tools, KMC’s team was able to translate complex designs into customized strategies and algorithms that controlled the powertrain and vehicle electronics for the SMACK. With this customization, KMC was able to take control of the vehicle’s energy management, powertrain control and vehicle diagnostics to create an efficient, safe and reliable electric vehicle. When KMC began developing its solar bus, the software algorithms it developed for the EV SMACK were able to be adopted, despite differences in hardware for the two machines. Since Raptor™ model-based development eliminates the need for complete algorithm rewrite, KMC was able to develop the Kayoola solar bus quicker and easier, saving time and resources in development. In addition to providing control software solutions, New Eagle is a key hardware supply chain partner to KMC as it grants the company access to reliable, production-ready hardware components like accelerator pedals, display units, connector kits and production-grade harnesses that are not readily available in Uganda. 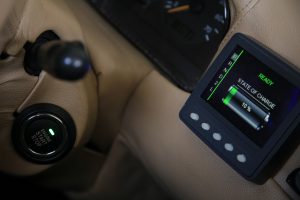 New Eagle’s Raptor™ Display module installed in KMC’s EV SMACK. New Eagle is a proud, continued supporter of KMC and the work it does to realize a shared vision for a cleaner, greener and more efficient world.